During WWII, one of the many slogans seen on posters and in brochures was “Make Do and Mend.” Making rag rugs (also called peggy or proddy rugs) was a way to do this. These type rugs are often confused with latchhook rugs that can be purchased as kits from many hobby and craft shops. Latch hooking uses a hinged hook (a bit like a crochet hook with a short hinge piece on the shank) to form a knotted shaggy pile from short, pre-cut pieces of yarn on backing material that is stiffer and has larger holes than used in traditional rug hooking. Latch hooking emerged as a craft long after rug hooking was well-established. 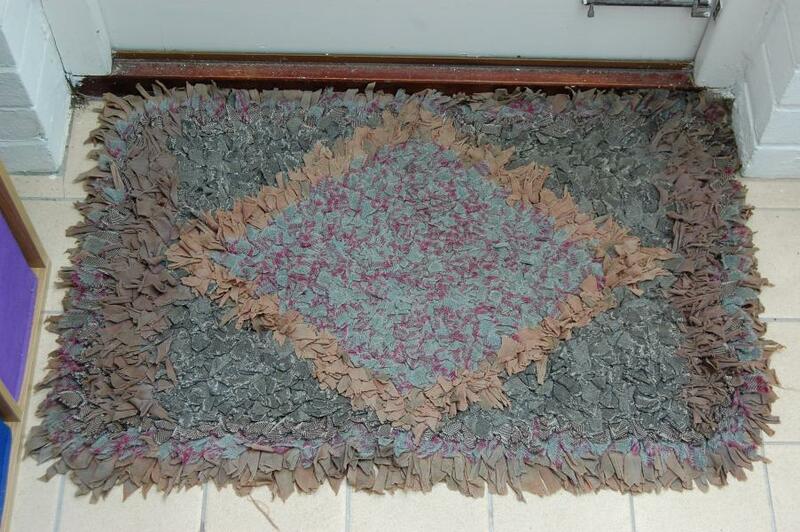 Latch hooked rugs are also generally “shaggy” and appear like the shag pile carpets popular during the 1970s. Proddy rugs use fabric, and the backing material is typically linen or burlap or other open weave fabric. The hooking material is cut into strips and pushed through the fabric from the back with a blunt pointed tool, called a prodder, an implement that resembles a short knitting needle with a ball handle. By working from the back, the rug maker can easily see and manage the design. During WWII, rug makers often used burlap grain or feedbags for the backing fabric and whatever was available – leftover scraps from worn out clothing, towels, blankets or other fabric household items – for the hooking material. The size of the rug depended on the amount of material at hand. Despite the utilitarian aspect of these rugs, the variety of fabric used allowed the rug maker to create a beautiful work of art.